Emergency Emergency God is issuing His urgent Amber Alert for lost souls around the world and He is commanding His Church to get on board and get involved. 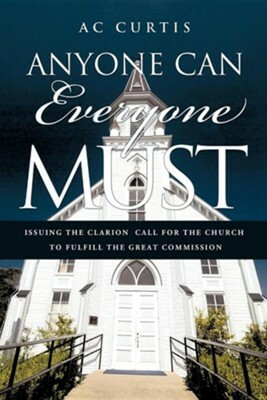 Every church leader must heed the warnings of God's timeless commission and begin motivating, mobilizing, and moving their church members to the mission field. What is that mission field? Each person's gift is different than the others, but the Call of God remains steady - we all must use whatever means necessary to find our specific place in fulfilling the Great Commission of Christ. It shouldn't take years of training and education. We have our clear instructions and, as the Church, we are that fully-functional vehicle ready for advancement of God's kingdom. We cannot afford to wait, nor hesitate. It's now or never. It's put up or shut up. Let's do it together "The passion in A.C.'s heart for the lost spills eloquently out on the pages of this book...a must read " Jeff Robbins - 4His Glory Ministries. AC Curtis has been involved with international missions for two decades and has just recently founded the non-profit international mission agency, Express Missions International. AC serves as director of this agency that brings humanitarian relief and the Gospel to thousands in Africa and Asia. His heart is to see the Church rise up and take its rightful position as Ambassador of Hope to millions who have not heard the Gospel. He is married to his wife of eleven years, Amy, and they have six children - ten years and younger. They live in Southaven, MS. I'm the author/artist and I want to review Anyone Can / Everyone Must.